Things get active in May around here, including rallying. Back when Annacis Island wasn't full of industry. 1969 ad. Racing at Langley Speedway for Saturday, June 10, 1967 was cancelled so the floodlights could be installed. Racing on Sunday, June 11, 1967 went off as per normal. 5,000 in attendance, 50 cars in the pits. Westwood in 1968, Canadian Sedan Championship series made a stop here. Wheelstanders! Gassers! Dragsters! Hope it don't rain! Some promotional news copy for an upcoming (1970) power boat race at Harrison Lake. The Saturday night race was cancelled for installation of the flood lights. I better post a link to this in my bookmarks. I tend to "lose" it and then "find" it. Lots of old hot rod things. And a Pacific northwest track roadster section. Information from various newspaper sources: Sun, Columbian, Surrey Leader and Langley Advance. Sunday, May 28, 1967 was rained out. There was a report on the Friday, May 26, 1967 race at Skagit Speedway. A few Langley regulars did well. Had a laminated ad for Arlington up on display at the Tradex show a week or so ago. Brought back a lot of memories for some. 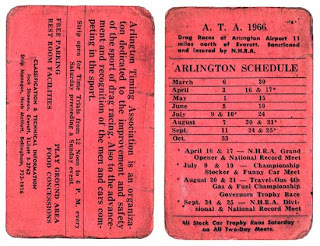 Arlington was the "go to" place for drag racing until Mission opened up in 1965. So I'm confused, again. I was all confident about putting up a couple photos of the Eagle Electric top fuel car that was at the Tradex a week ago. Even had found a clipping from Arlington, 1967, to add to all the history. But now I'm not sure if this car did what the 1967 clipping says it did or the newer version of the Eagle Electric top fueler, built in 1966, and restored by Bucky Austin. Aw well, put up the info, let the experts tell me how wrong I am. Last summer the Langley Speedway Historical Society took possession of the former B modified of Jack Cross. It had been at the Victoria Auto Racing Hall of Fame. 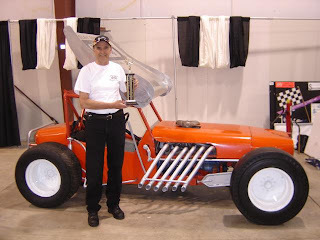 On the weekend of April 25/26 at the BC Classic & Custom Car Show at the Tradex in Abbotsford the car took the "Best Race Car Open Wheel" trophy, the first trophy it has won off the track. While the car was never all that lovely the new Langley Speedway Historical Society trophy girl sure is!